When we talk about space exploration and watches, the conversation quickly leads to the Apollo Program and the Omega Speedmaster. However, we do know of watches and indeed men that made it to space earlier. One such man, Mr. John Glenn, died last week at the age of 95 after a lifetime of achievements, including becoming the first American to orbit the earth. The first Swiss watch to make it into space was not an Omega or even a Breitling, it was a Heuer – model 2915A, a stopwatch. This was not a known fact for many years after Glenn returned to earth and the details were uncovered. 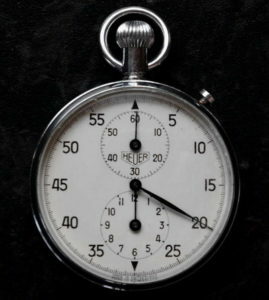 John Glenn’s stopwatch appears to be a standard Heuer stopwatch, Reference 2915-A. 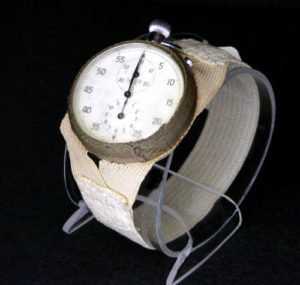 The stopwatch is attached to the wriststrap by a cloth bezel (and perhaps some adhesive at the back); the wriststrap appears to be elastic. John Glenn, shortly before the launch of MA-6, walking from crew quarters to the vehicle that will transport him to the launch-pad. Note the Heuer stopwatch, on Glenn’s right wrist / forearm. 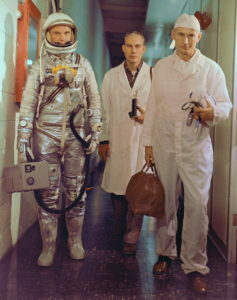 View of Astronaut John H. Glenn Jr., Dr. William Douglas, Astronauts Flight Surgeon, and equipment specialist Joe Schmitt leaving crew quarters prior to Mercury-Atlas 6 (MA-6) mission. Glenn is in his pressure suit and is carrying the portable ventilation unit. Date photograph taken — 1962 February 20. 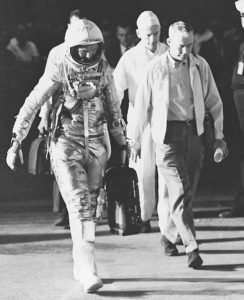 Overall view of astronaut John Glenn, Jr., as he enters into the spacecraft Friendship 7 prior to MA-6 launch operations at Launch Complex 14. 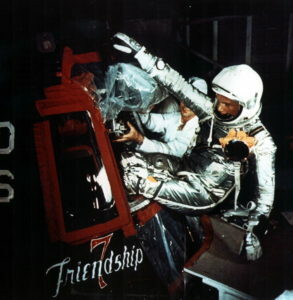 Astronaut Glenn is entering his spacecraft to begin the first American manned Earth orbital mission. 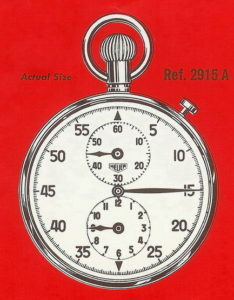 Below is the description of this stopwatch, from Heuer’s 1961-62 catalog, along with an illustration of the watch. 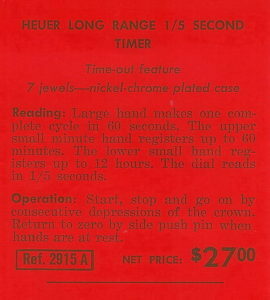 How fitting that Heuer referred to this one as a “Long Range Timer”. Very interested. Thanks for bringing to our attention. We all learn much from reading your weekly column. Keep it up. True hero – Right Stuff. A lot of faith in an inexpensive watch. Life on the line. Never knew this. Thanks, Mark! Inexpensive watch? Not at the time. Heuer was top of the line, and the 12 hour watches were relatively rare as most people were fine with a watch that measured up to 1 hour. I don’t think $27 was inexpensive back then. it was a very, VERY good watch for the time. Mark, ever thought of having an easy twitter link to your articles? There are many watch nerds (including me) that would enjoy your articles. Just a suggestions. As always a great story. Have a merry Christmas. Mark, do you know where the watch is now? Whatever the relative cost Colonel Glenn did not have to purchase it, we (taxpayers) did and money well spent I’ll say. Of note, I always wondered when the astronauts walked from the ready room to the transporter they had to lug along their own suit ventilation unit somewhat being heavy. Take a looksee at the second photo of him doing so and if fact a different one to boot. The Smithsonian Air and Space Museum has control of the artefact. Really nice article. Just discovered your blog by chance and I love it!